Mr and Mrs. William Howorth, of 1 Underbank Road, Hutch Bank, Haslingden, are informed that their elder son, Private. 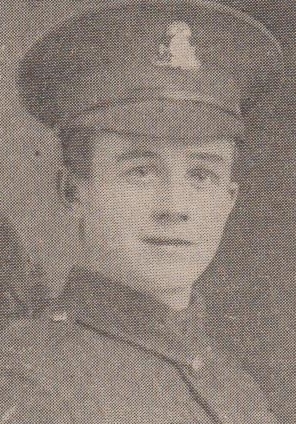 Ernest Howorth, Loyal North Lancashire Regt., was killed in action on November 15th 1916. He was reported missing on that date, and a few weeks ago Sergt. Brown, a Preston man, wrote to the parents that their son had fallen. Since then Sergt. Brown has been wounded and while on leave he has seen Mr and Mrs. Howorth and confirmed the sad news. He adds that their son was a brave, cheery little soldier, and that he was given a soldier's funeral. The deceased was 20 years of age, worked as a weaver at Plantation Mill, and is on Ebenezer Baptist Church roll of honour. He joined up on May 11th 1916, and went to the front in the following September. In loving memory of our dear son Private Ernest Howorth, killed in action , in France, November 15th 1915. Where our son and brother sleeps in slumber." Ever remembered by his Father, Mother, Sister and Brother, No.1 Under Bank Road, Hutch Bank. A beautiful memory left behind." Ever remembered by his Father, Mother, Sister and Brother Harold (in Suffolk), 1 Underbank Road, Hutch Bank, Haslingden. A dear one gone for ever." From his Parents (William and Elizabeth Howorth), and Brother and Sister, at 1, Underbank Road, Hutch Bank, Haslingden. And died beloved by all."